We are working with the Hugh Thompson Chapter of Veterans for Peace to host the Memorial Exhibit in San Diego on March 16 next year to commemorate the 50th Anniversary of the My Lai Massacre. This will be a key event on our first tour through the southwest and up the west coast in the winter and spring of 2018. We are also working with VFP chapters in Santa Fe and San Francisco to host the exhibit on this tour.If you are interested in hosting the My Lai Memorial Exhibit check out our website. LINK. Hugh C. Thompson, Jr. (April 15, 1943 – January 6, 2006) was a helicopter pilot during the Vietnam War. He is chiefly known for his role in stopping the My Lai Massacre, where more than 500 Vietnamese civilians were killed by US soldiers during a four hour period. Hugh Thompson was flying a reconnaissance mission. 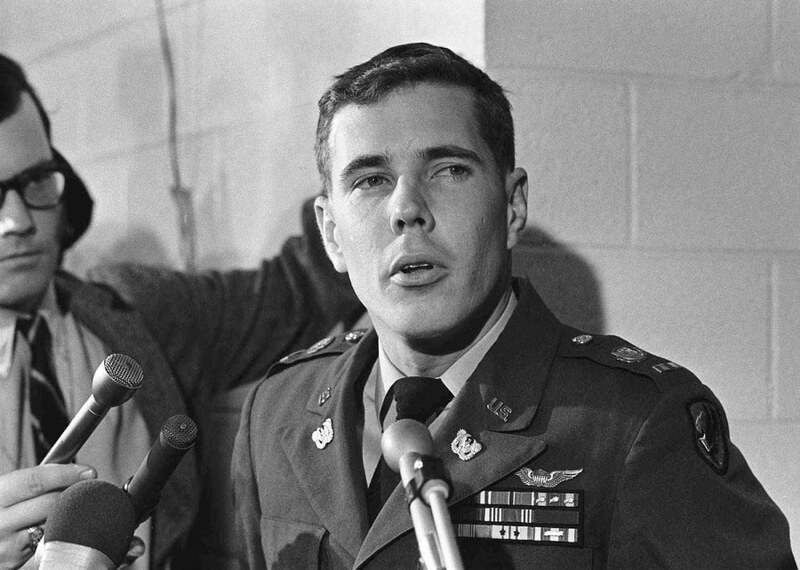 When he witnessed the killing of civilians at My Lai, Hugh Thompson landed his helicopter. He placed his two men between the soldiers and the ditch. He instructed his two crew members to open fire on their American comrades if they attempted to kill one more villager. Hugh Thompson then went about convincing ten terrified villagers to come out of a small earthen bunker that they were hiding in. He also discovered an 8 year old boy in the ditch. He was alive and was clinging to his dead mother. Thompson called for additional helicopter support and they transported these few remaining villagers to a hospital and saved their lives. His radio transmissions caused the senior officers watching the massacre unfold from above the village, to send instructions to the officers below to stop the killing. Commanding officers then initiated a extensive cover up that kept the news of the massacre secret for 18 months.